Category: Managing T1 Diabetes / Hypers and Sick Day Rules / Self-monitoring and Tracking / Dose Adjustment and Carb Counting / NHS Service, Hospital or Clinic / How is T1 Managed? Good clear flowchart to advise someone with Type 1 diabetes how to manage sick day rules. Easy to carry, excellent resource. 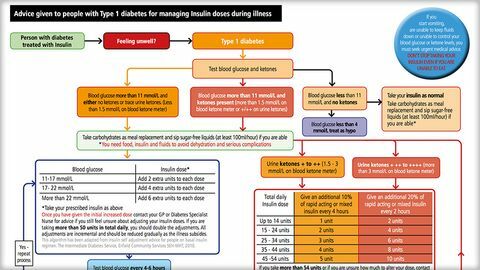 Easy to use flowchart with guidelines on how to adjust insulin doses to deal with higher blood glucose levels when unwell.